When one is doing a Big Year in New York one must go on pelagic trips. As many as possible. Because I wasn’t doing a Big Year at the beginning of the year I didn’t go on the February trip out of Freeport so I had a giant hole in my year lists where wonderful alcids like Common Murre, Dovekie, and Razorbill should have been. And while the pelagic trip in September helped with my year list, alcids are not at all likely to occur in New York waters in September, and, not surprisingly, we didn’t see any. This is why I spent all day Sunday on a boat on the Atlantic Ocean in sleet, rain, and snow. When I arrived at the boat on Sunday in the predawn darkness I was not awake yet and I wasn’t sure how I had managed to arrive in Freeport after having arisen in Queens. It was nice to see some familiar faces and catch up on the birds that everyone had seen recently (there were at least four other birders on the boat that I knew of who had already cleared 300 species for the year, including a couple in the 320’s) and by the time the Captain Lou VII was off I had come out of my stupor and was ready for some birds! Too bad it was still dark. As the boat cleared Jones Inlet and headed out to the open sea the sun had risen (though it stayed behind clouds all day) and we were out on the deck hoping to see some good gulls or ducks as we cruised due south. 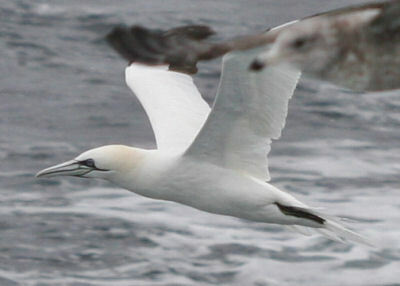 We didn’t pick up anything terribly rare but we did see Northern Gannets which are always a pleasure. 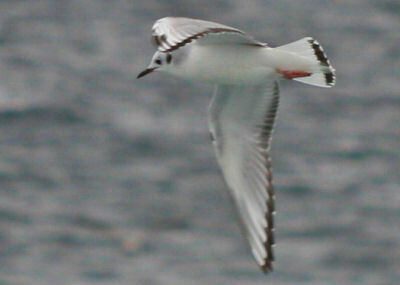 Oddly, the beginning of the trip, led by Paul Guris, the genius behind See Life Paulagics, was highlighted not by the alcids, gulls, fulmars, and kittiwakes we were hoping to see, but by land birds swept out to sea by the strong northwest winds overnight. We spotted a Fox Sparrow, at least one Red-winged Blackbird, an American Pipit (identified by ear), an American Goldfinch, a White-throated Sparrow, Dark-eyed Juncos, a flock of seven birds that were not identified but were probably Horned Larks, and, most amazingly, two Common Redpolls that landed on the boat, providing a couple pelagic participants a most unexpected lifer! The other highlights of the early going were both Dovekies and Atlantic Puffins, year birds for me and birds that the captain carefully maneuvered the boat as close to as possible to get everyone the best looks he could. At least, we did this for the first several sightings until it got to the point where everyone had had their fill of both. That is not an uncommon occurrence with Dovekies, of which we ended up tallying more than 200, but for Atlantic Puffins, well, we hadn’t dared to hope for more than one or two, but by the end of the trip we had spotted 22! A single Razorbill was spotted in the distance and by the time I got to the side of the boat that it was on it was in the air and pretty distant. Fortunately, I was standing near Paul, who, as always, was making sure people knew the field marks, including the triangular tail. We had been hoping for a Pomarine Jaeger, the most likely jaeger at this time of year but somehow the only jaeger we saw was a Parasitic Jaeger (Update: a review of photos by expert birders has determined that the bird was in fact a Pomarine Jaeger. Now I have the dilemma of whether or not to count it.) that flew past the boat and looked like it was going to fly into the crowd of gulls chumming in our wake but, in a surprising role reversal, a Herring Gull chased it away from us disappointed birders. And the larids, ah, the larids. In addition to Bonaparte’s, Ring-billed, Great Black-backed, Herring, and Laughing Gulls we had much better looks than I had Saturday at not just one Lesser Black-backed Gull, but three! Of three different age groups! 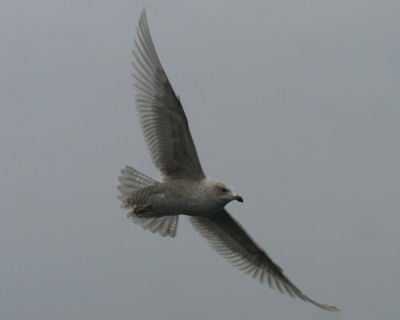 And not one, but two first-year Iceland Gulls. And I haven’t even mentioned the Black-legged Kittiwakes! 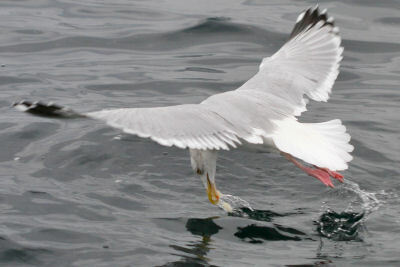 Wonderful, especially the birds that were behind the boat, gobbling down chum. And don’t ever, ever let balloons go to fly up, up, up and out of sight. They end up killing birds. That’s what the balloons that you let go do. They kill birds, that, besides their intrinsic value as living creatures, I really want to see. 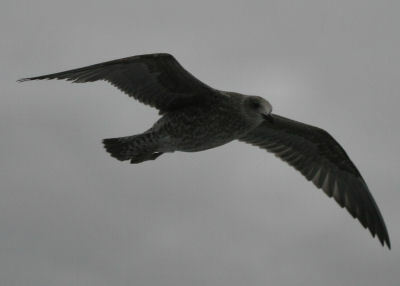 Apparently, Northern Fulmars really like Easy Mac. Fortunately for me, a short while later three more fulmars were spotted resting on the water some distance from the boat. 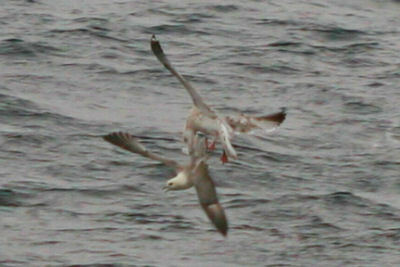 As we approached a Herring Gull beat us to them, attacking one of the fulmars viciously for no reason we could see. Oh, and I got a picture of the assault. 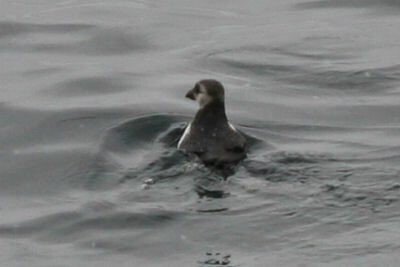 By the end of the trip we had seen no fewer than twelve Northern Fulmars, including a dark-morph and a medium-morph! Not bad for a bird I had never seen before. 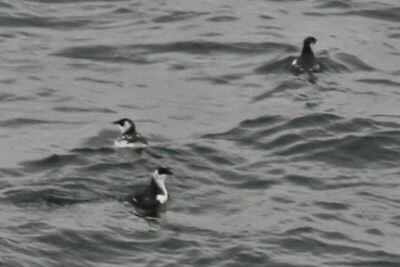 And make sure to check out Rich’s recounting of the pelagic as well. Dang, that sounds like an outstanding trip! And your photos, sir, are insane. Very nice in a very nice way. Of course you can count the Pomarine, come on! How often have you relied on taking pictures of birds that are difficult to identify out in the field and relied on identifying them at home with the help of images and identification literature? Why not when it’s a lifer? Or notes: of course we sometimes write down notes of difficult birds to check their ID at home. If you saw a strange dowitcher, took some notes and established back home it was a short-billed, would you not count it because you haven’t identified it immediately? 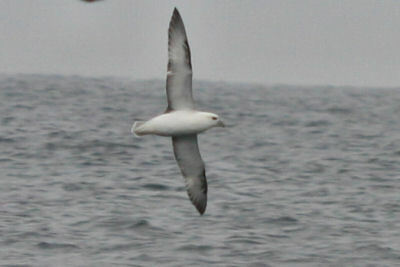 You’ve seen the bird, you noticed it, you weren’t sure out in the field and it was established later it was a Pomarine. Check. It’s a different story to identify a bird you have not seen out in the field from a picture. A birding friend of mine once came to visit me and showed slides of his birding trip to Israel. On his bird slides, I was able to point out two “lifers” for him in the background, birds he had accidentally caught on film while he was taking pictures of other birds but never noticed their presence while taking the pictures. Surely his eyes had fallen on them at one point or another, but that is something one should not count as a lifer (of course he didn’t, but he also never showed me slides again). But please, Corey, don’t be “strikter than is allowed by the police” as we say in Germany, that Pomarine counts! Count the Pom? Absolutely. You saw the bird, you count it. You think those world listers who go on overseas trips and who can’t actually ID for themselves more than 1 in 10 of the species the guide points out only count 1/10th of the birds they see on their 5000USD trip?? Not in this lifetime. Clear conscience on this one, Corey – 100%. Count it as long as the photograph was good enough to clearly ID the bird and if you saw it in person and everyone agrees it was Pom, why not count it? 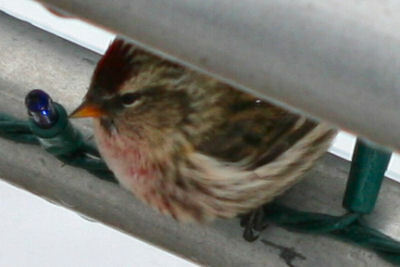 That Redpoll is amazing. Sounds like a ridiculously awesome trip. I’m jealous. I remember that when I was in elementary school, we used to release balloons as a class project, with name/address cards attached to see where we would get responses from. I shudder to think, now, how much carnage we probably caused. @Mike: Thanks, and it was a great trip! @Jochen, Charlie, Will, Patrick: I still haven’t seen any shots of the jaeger (and I didn’t get any seeing as I was just using my 100mm lens and it never came very close). And I’m still hesitant to count the bird simply because every other bird I’ve seen this year I felt that I got solid looks at field marks that allowed for a positive ID (or, in the case of the Saw-whet Owl, clincher listens). And, a Pomarine Jaeger would be a lifer in addition to a year bird…so, I’m gonna think about it some more. At least I know it’s a wild bird and not an escapee! @Carrie: I recall doing the same as a kid and I hope that youth groups/school classes/private individuals have stopped such activities! I too was on the Freeport pelagic. When the jaeger was first called out I happened to be in the right place and got good looks at it. I’ve only seen a handful of Pomarine and Parasitic Jaegers, but my first impression of the bird’s elongated central rectrices said “Pom”. They looked blunt-tipped and twisted. 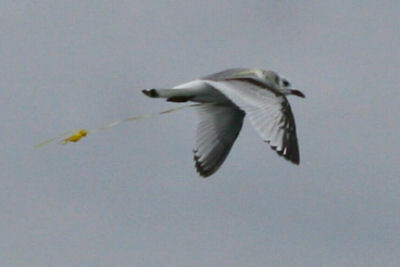 But it looked comparatively smaller than the gull that chased it . That, my minimal experience with both species, AND Paul Guris’ ID of it as a Parasitic, made me question my own eyes, so I deferred to the call on the boat. I guess I should have trusted my eyes and instincts! Would you mind telling me how and when you first heard that it actually was a Pom. 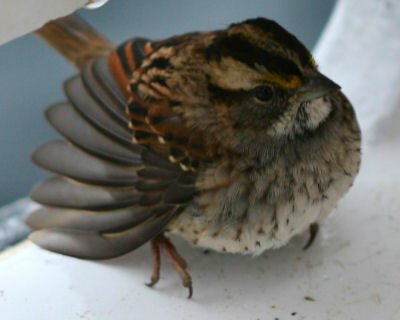 Also, are there any photos of the bird available on the web or that you’d be willing to e-mail? Thanks. @John: I heard about the ID change in an aside in an email, and I’m not sure who actually has pics…I’m sure someone will respond to your NYSbirds listserv post though. Follow your heart, Corey. It’s not always good advice, but it is in this case. A list is a very personal thing in the end. It is a distillation of your experience, a commemoration of your triumphs. Plenty of people enjoy listing birds that they don’t have a prayer of identifying. Either you’re one of those people, or you’re not. You probably already know deep down. You’ll be happiest if you stay true to your instincts, whether that means adding another bird to your list or deciding to wait for next time. Fantastic photos, Corey. You can say that this pelagic trip was well worth it, wasn’t it? I had never heard of a dovekie before, but I just checked one of my field guides (one I don’t use except when I travel back to the East Coast) and found that dovekies are really small (and cute) and are strictly north Atlantic alcids. Well, that’s one alcid I may never see. Thanks for sharing your trip with us. We are publishing “Burridge’s Multilingual Dictionary of Birds of the World” with Cambridge Scholars Publishing in the United Kingdom, which will cover some 45 languages so far. in flight appearing on Google Images and your home page. Please state your title and institution as you will want them to appear in the acknowledgement for your assistance, which will be greatly appreciated, and your address where you would like to receive your complementary copies of this volume and the Latin key. @John: I’ll be contacting you via email…and I’m honored!